I am an American artist who creates figurative compositions with women as my primary subject. I work in all mediums, but prefer the unpredictability of painting and the humility and vulnerability required in every stroke of oil onto canvas. My work is sometimes inspired by great literature, my raw material comes from real life. My images are evocative, working through moods and memories to find what it means to feel human. I am especially interested in images of women under stress and the social inequalities they endure. Each portrait is developed into a character through the use of costume. 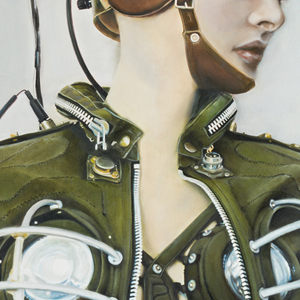 My painting "Hard Work Never Killed Anyone" projects a woman almost institutionalized, a drone figure dressed in military fatigue wrapped in wires and electronic devices. There is a sense of drama, a feeling that something pivotal is about to happen - or has just happened. The woman exchanges looks with the viewer - perhaps in a moment of empathy. My work titled "Hard Work Never Killed Anyone" was chosen for the President's Award in 2011, by juror Shiva Amadi for a National Women's Arts Exhibition titled "From Our Perspective." My work was also chosen for Honoring Women's Rights: Visual Voices Together exhibition held at the National Steinbeck Center Museum, 2012 and was included in a contemporary portrait exhibition in Lecce, Italy featuring the work of Andy Warhol and Xiao Lu. My work was exhibited with forty-six artists from thirty-one countries in an International Art Exhibition in Florence, Italy in 2010, and the following year in Ferrara, Italy at the Castello Estense to bring public awareness to Human Rights issues. I studied abroad in Venice, Italy in an international program and received her Master's Degree of Art from New York University. The underlying foundation and basis of her work are inspired from the words of her mentor, artist Angiola Churchill: "Every woman is a feminist. And every woman deals with feminism in her own personal way. You can either shout, scream or whisper, but in your lifetime, you will have to deal with some kind of equality issue. As an artist, it's your responsibility to find your voice." My artwork has been featured and sold in international exhibitions and in American galleries, donated to several non-profit organizations, and commissioned by large corporations such as Johnson and Johnson and The Newark Museum. Her work has been recently added to the private collection of Sir Paul McCartney and Lady Nancy in Sussex, England.